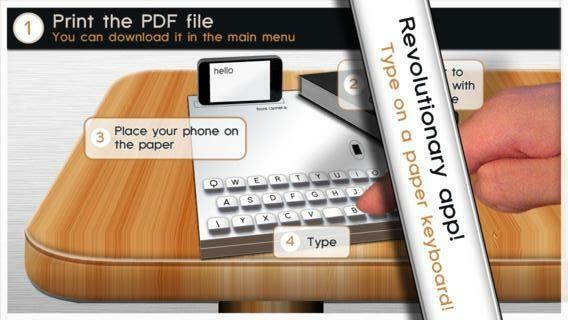 Print You Own iPhone Keyboard On A Piece Of Paper | OhGizmo! Maybe you find the keyboard on the iPhone a tad too cramped? Your big meaty fingers make a mess of everything? Maybe you’d be better off giving this application a look, then. It’s called Paper Keyboard and involves you physically printing a special keyboard on a piece of paper. You know, like people did in 2006? Print stuff in 2D? Right, so once the keyboard is printed, you place your phone in the specially designated area and its front facing camera takes care of the rest. Its “sophisticated algorithms” track where your fingers are and register the key presses. You’re then free to use that text in other applications. Now… we’re not sure about this one, cool as it sort of sounds at first. If you’re able to print something, there’s a good chance there’s a full computer nearby, no? So why not just use that? Like, this could be useful if you have to type a really long email and don’t want to stare at a tiny keyboard for the whole thing. But if there’s a computer nearby… what’s the point? In any case, it’s free to download and try out, though they’ll ask for money if you want to use the in-app chat application.